This carnivorous pitcher plant is native to north America and commonly grows on the southeast coast, especially the Florida panhandle. 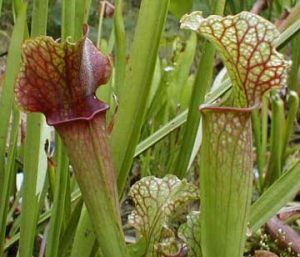 There are a number of varieties or cultivars of this pitcher plant with some having pitchers up to 3 feet tall and many color variations. It produces smaller pitchers in the spring and taller ones in late summer and fall. The flowers are a beautiful crimson color. The dried pitchers are often used in flower arrangements. Poaching and habitat destruction threatens the survival of this unique plant. The tall pitchers with their unique white patterns make this pitcher plant easy to spot in it’s native habitat. Many varieties have various amounts of red color with some being almost entirely red. 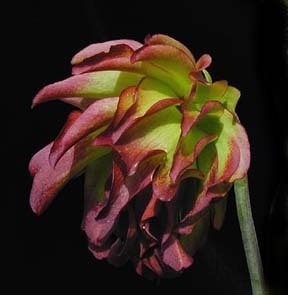 Tarnok is a form of S. leucophylla with a unique double flower. The flower is sterile. Other than the flower the plant is indistinguishable from the species.